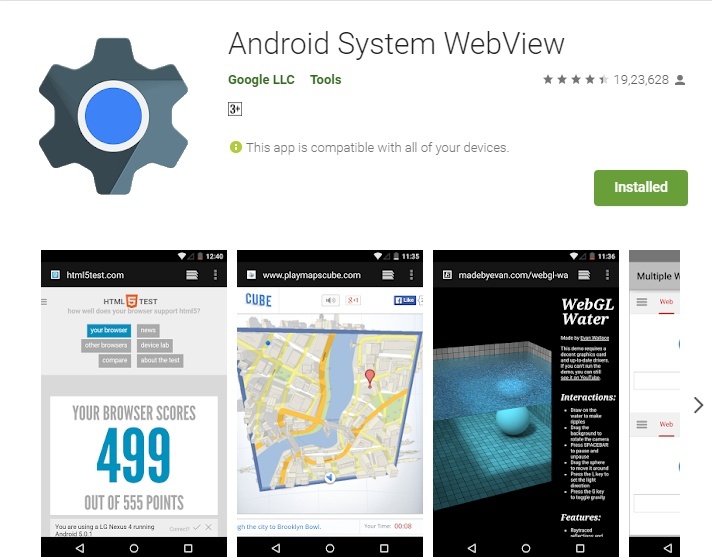 What is “ANDROID SYSTEM WEBVIEW” in Android Device ? and what is Use of It ? When You go to your Android Phone’s App Manager, you Find App named “Android System WebView” When Anyone See this App the question comes into everyone’s mind that What is Android System Webview ?, what is it for and what can I do with This App. So We Try to Find The App in App Drawer But it’s Not there, and we confused. So to get rid of this confusion Read the Full article, We will tell you all about the Android Web View app and Answer some FAQs about it. So Keep Reading. It is an Android Application which is developed by Google and Powered By Chrome and it is one of Google’s Preinstalled App in Android Phones (In Many Versions). It Is Designed to Help the developers to Give inbuilt web browser to the users in any Android Application and it Helps Android Mobile to Save the Memory Used by Extra resources(in Chrome). Basically, it makes Possible For Android Applications to display web content to make user Experience better. For Better Understanding Let Me Tell you with some Android Webview example. When we are Using Facebook App and try to Open a Link then it gets opened on Facebook without opening Chrome or any other Browser. that’s because of the Android Webiew. Hope You understand Whats is Use of Android WebView and What is it For. Here are Some Answers For Some Popular Questions People Want to Know About Android webView Application. Should I delete Android System Web View? First Thing is that You Cannot uninstall the Android Web View App by Normal Method. You Need to Use Some Advanced Method to Uninstall this App. But wait, Do You Really Need to Uninstall Android Web View App? No, Because it is System App And used in Many App to work Properly if You Uninstall this App Many Functionalities in Many Apps May Not work properly. And If You Try to Uninstall this App For Free More Memory then Let me tell you There are no Memory Benefits From Doing This. So Don’t Uninstall This app. Can I Disable Android system web view? You Can Disable This App If You Don’t Want to run it. And Enable it when you need it. Do I need android system webview ? Yes, Because Many Applications Work With it And cannot Run Properly without this Webview App. Is Android system webview spyware? No, this App is From Google. We Can trust On this Application Blindly.